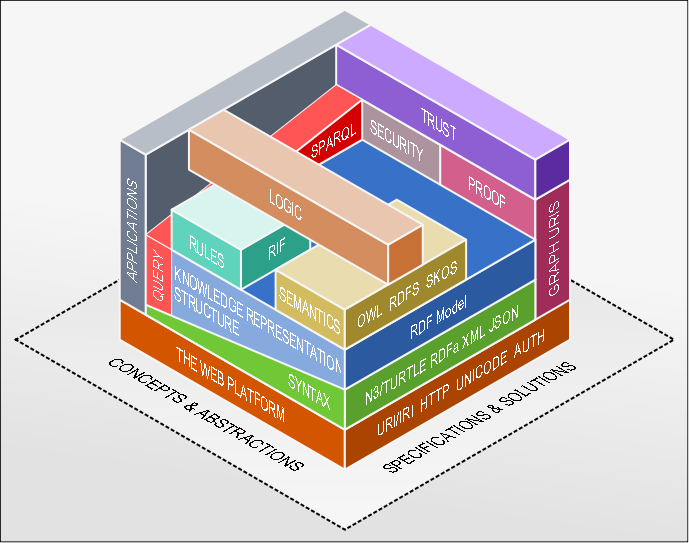 Here is a visualization of the common, layered Semantic Web technology stack. This graphic is a modified version of the Semantic Web technology stack visualization created by Benjamin Nowack. This figure is freely usable and sharable under the Creative Common Attribution 3.0 Unported license. This entry was posted in description and tagged bnode, CORS, HTML, HTTP, hypertext Web, IRI, JSON, Linked Data, LOD Cloud, N3, Named Graphs, OWL, provenance, RDF, RDFa, RDFS, RIF, Semantic Web, Semantic Web Architecture, Semantic Web technology stack, Social Web, SPARQL, Turtle, URI, Web, Web Architecture, WebID, XML. Bookmark the permalink.